Friday evening I came home from work to a hot apartment: it was raining all day so I had left the windows closed. When I do that my apartment warms up pretty quickly, mostly due to the refrigerator and computer I suppose. I put some rice on for dinner and opened up the windows but it was still pretty hot. Since I absolutely never have any visitors, I stripped down to my shorts and tried to cool off using the fan. Sometime around 8pm or so, the doorbell rings. This is very unusual. Nobody ever comes to my place unless I'm expecting a friend or a delivery. Since neither were on the schedule, I assumed it was just some sort of salesperson. I probably should have thrown on a T-shirt and pants, but I figured I could get rid of him fairly quickly, and if he wants to bother me right before dinner he can put up with a shirtless foreigner for the time it takes for me to get rid of him. When I opened the door, I was surprised that the person there was a NHK representative. I had previously had one visit from the NHK guys. NHK is the Japanese national broadcasting service, like the BBC. They are supported by the government and officially people who have TVs are supposed to pay a licensing fee. I don't have a TV, but I do have a computer monitor that has an internal analog TV tuner, and since I was watching NHK News at the time, I felt like I should pay up. I didn't pay last year when the guy came around, but since then I've been watching a lot of NHK news in the morning and evening (it is good practice) so I really felt like I should pay. So I did. It was about $30 for two months worth of the broadcast fee. I'm planning to move at the end of next month, so I don't think I'll be paying further licensing fees, but I'm glad I did pay at least once. Also, some foreigners on the expat blog community have warned of scams where someone pretends to be the NHK guy for collecting licenses so some foreigners are wary of paying. This guy was the real deal though, and I've got some nice official paperwork backing things up. I was looking forward to getting a bit of extra sleep on Saturday night, but at about 8:45am this morning, there was a pretty big earthquake north of Tokyo (centered on Iwate, a low level 6 on the Japanese scale) which caused shaking down near Tokyo. It was very minor, not strong enough to move anything off my shelves or bookcases, but enough to convince me to get out of bed. Everything is fine for me, although it was pretty strong farther up north, so I'm watching TV (NHK, I'll have a post about that shortly) to see if there were any injuries or damage caused near the center of the earthquake. I don't really have much time, because I have to pack still, and then get on a plane to go to Morocco for a conference, but I wanted to make a quick note of things. The only pictures I have are blurry (dad doesn't know much about cameras!) but here is one with Alana, L., Jana, and I. About two months ago I started the process to convert my Texas Driver's License into a Japanese Driver's License. I expected it to take a long time, but actually things went more quickly than I expected. At least for me, I needed a certified copy of my driving record from the Texas DMV because the driver's license does not have a date of issue field on it. I also needed a translation of that. I think that is everything. It took me a while to collect everything, and to get the translation of your driver's license you have to trek out to the Japan Automobile Federation, but at least it only takes about half an hour and $20. I was able to get a copy of my driving record over the internet, and then I translated it myself (which seemed to work fine -- suckers!) and headed out to the Samezu Driver's License Testing Center and spent about two or three hours applying for the paperwork to take the road test. If you are a citizen of France, Australia, Canada, and a few other countries you don't need to take a test. You just show them your license, and they give you a Japanese license. That is pretty nice. In my case I had to take a written test - absolutely ridiculously easy - one of the questions was "Is it ok to drive after drinking alcohol if you only have a little bit?" The other nine questions, of which you have to get seven correct (I think), were similar. There is also an eye and hearing test. The eye test is pretty simple: no alphabet, just a bunch of circles with a hole in the top, bottom, left, or right. It isn't really too hard to pick that out. You have a 25% chance of being correct, which is much easier than say, 1/26 like you would have in an American Driver's Test. Anyway, if you pass those pretty low requirements, you then get to apply to take the driving test. I had to wait about a week or two I think. Another problem I had was that since my passport is my second passport, the people there said that there wasn't proof that I was in the US when the license was issued. Unless I brought in my old passport, I would have to put a "New Driver" sticker on my car for the first year or two. I eventually was able to get that, so it wasn't a big deal, but I was really surprised. Did they honestly think that even though I have a driving record that says I've had a Texas Driver's License for twelve years, I somehow wasn't in the US for that time and didn't do any driving? In Japan people drive on the left-hand side of the road. I'm not used to that. The day of the driving test they explain the 1600 meter course to you, and you sit in the back seat as someone else drives the course. Then you move to the front seat. Since they drive on the left-hand side of the road, the car's steering wheel is on the right-hand side of the car. That also means that the turn signal is on the right-hand side of the steering column. When I took my turn to drive, on the very first turn, I hit the wipers. Ha ha. I did it on the next turn too. And the next. The driving instructor was clearly getting annoyed, making unhappy noises at my clearly foreigner mistakes. It made me nervous. Even worse, my left eye is weaker than my right eye. It is lazy. I don't use my left eye very well. Since I'm driving on the left-hand side of the street, I have to track the curb with my left eye, and that wasn't working well at all. On a straight road, I bumped into the curb and the instructor exploded: "That's dangerous! Aren't you even looking! What's wrong with you!" He called off the rest of the test and I didn't even get to try the S-turn and 90 degree angle turn "crank" portions of the test. That really unnerved me because not only did I have to get used to driving on the other side of the road, I really felt like I needed to practice using my left eye for monitoring distance. I'm really bad at judging distance because of my eyes: I don't have good depth perception. This is really tough for me. I was positive that I would window-wiper and curb-bump my way to ten more failures. So I checked around and the local Tokyu Driving School will let you ride around their practice area in one of their cars for 15 minutes for free. So I went and did that, and then signed up for a 50 minute practice lesson. The practice lesson is 50 minutes in the car for only 4,600 yen. That is a steal: normal driving school in Japan costs around $3000 or so. During the free trial I hit the window wiper a few times, but not as often as before. The practice session was scheduled for a week later, two days before the driving test. The practice session really helped a lot. I used the same trick that I use in America to judge where I need to be in the road: determine empirically where the lines on the road need to disappear into the hood in order for your car to be centered in the lane. I only used the window wiper once. I never hit the curb, except for once on the S-turn course. Since I ran through the S-turns and crank turns about 10 times each, I think that was pretty good. I was feeling pretty good about the driving test. Two days later I had the real driving test. Things went beautifully. No trouble. I am proud to announce though, completely in opposition to what I would think is common sense, the Japanese government has licensed me to drive on their roads. I think this is a problem for a few reasons. First, I am seriously not used to driving on the left-hand side of the road. I think it won't take too long for me to get used to it, but I really should have a Beginning Driver mark on my car. Second, this test is really simple. You only make maybe three right-hand turns. You don't have to go on the hill portion of the course, or cross the rail-road tracks. You don't have any crazy multi-lane turning tests. One thing that surprised me is that if you are turning right from a two-lane road onto a two-lane road, you turn into the far lane, not the near lane. That means you have to cross two lanes of traffic instead of just one. That seems strange to me. Anyway, I'm really surprised at how much I have changed since when I first got my license. At 16 (or was it 17?) I was ready to drive anywhere. I was excited, and wanted to hop into a car and go. Now, after living in New York City for eight years, I am worried about driving in Tokyo. I don't want to drive if I can avoid it. When I do go driving, I'm going to drive slowly, I'm sure. At least until I'm out of this city and into some less congested roads. That said, I'm kind of looking forward to going for a drive sometime with L. :) I'm not sure how insurance works here though, so I'll have to look into that. I've been neglecting my blog lately. Work has been busy, I'm getting married, family is coming to visit, etc. etc.. These things happen all the time, and it is no reason to ignore your beloved blog. I spent a bit of time today and fixed two things that had been bugging me: the admin control panel now links to the post for posts with new comments (bBlog isn't under active development anymore, but it is a very clean and easy to understand system. It is lots of fun to play with.) The other thing I fixed is that I moved the avatar images to be flush with the blue comment boundary. I would like to work a bit more on the template so it looks a bit more unified, but I'm not really a graphics guy. Back on topic with the New York Doughnut Plant, I was really excited to check it out but it is closed! They are remodeling and will be until sometime in September! I'll have moved away from my beloved Jiyugaoka by then! Oh noes! No doughnuts for me. Next up on the docket are the new express trains on the Oimachi line. I often take the Oimachi line from Oyamadai (my beloved small town where I live) to Jiyugaoka (the nearby "big" station) where I can transfer to the more respectable Toyoko line. I take it every day to go to work. The Oimachi line is pretty small, only 10km from end to end. If the weather is nice, I'll just walk. I live very close to the tracks, basically separated only by a narrow road, so I hear the trains go by all the time. One thing that really surprised me is that these new express trains are much less noisy than the local trains. They look pretty cool too. I'm going to miss the noise of trains going by every ten minutes or so. After about two years, it is strange how comforting the noise has become. I know that if I haven't heard trains go by in a while, I really need to get to bed. And they give you a good incentive to wake up when you really should be awake. Finally, one shot of the Cherry Blossoms in Jiyugaoka. I made it through the whole cherry blossom season without posting any photos (I do have a bunch that I could upload, but it seems very clichéd.) I kind of like the cherry blossom trees that line the Jiyugaoka shopping street. So I'm a bit late on this -- I meant to write something last night, but never got around to it -- but there was a medium-sized earthquake two nights ago (Wednesday night.) Actually, it was early Thursday morning, at about 1:45am. I was in bed, somewhat asleep, when my dreams started to become strange and wave-like. The entire bed was swaying. There have been a few small earthquakes in the two years that I've been in Tokyo, but this was one of the bigger ones. In my strange dream-like logic, I thought "Should I wake up and run outside?" I convinced myself that the rocking, wavelike motion was kind of pleasant, and somehow thought that I was a on a nice boat. I feel back deep asleep again shortly. It was apparently a fairly big earthquake - showing up on the the local blogs. Checking some of the earthquake report sites it looks like it was a 6.8 on the US scale, and a 4 or 5 on the Japanese scale. Anyway, things were fine in my place. I think a pen rolled off one of my tables, but that was about it. I'm up on the 4th floor of a 4-story concrete "mansion", and that thing really gets swaying! I'm a little worried now thinking about "the big one". 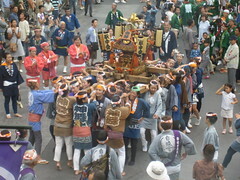 Benkei is convinced that the big one is coming and will hit Tokyo soon. A friend of mine at work said the same thing. I'm not so sure: I don't really know much about how earthquakes work. Since I'm in the process of buying a place here though, I've decided that the big one is not coming, and our new place will be built to withstand it even if it does hit. Unbridled optimism is a great power if only you can harness it correctly! There were a lot of people there, about 30 or so all told. The purpose of the presentation was to introduce the plans to make a corpus of Japanese blog data available for research use. The presentation wasn't too detailed about what exactly will be released, but the current plan is to make the data available to researchers in July of 2008. The data consists of post entries from the Yahoo! Blog service where the users have agreed to allow their data to be collected and used in such a manner. The post comments are not included in the data, and the corpus will possibly have things like proper nouns anonymized and other things done to protect the privacy of the people in the data. It is really nice to see people thinking about putting together this kind of data for research use. I haven't found a URL for the project or I would post that - the contact section of the handout says to email Professors Toukura, Professor Oyama, or Mr. Maekawa, but I suspect there will be information on the main NII homepage about the data release when the time comes. In addition, Mr. MAEKAWA spoke a bit about the Balanced Corpus of Contemporary Written Japanese, which looks very interesting. The project to build the corpus runs from 2006 to 2010, so they are only about two years into the project right now, but it is looking to be something like a Brown corpus for Japanese. It contains three sub-corpora, published material from 2001~2005 (magazines, newspapers, and books) and material from 1986 - 2005 from library sources (books mostly it looks like), and a mixed domain sub-corpus with web data, white papers, text books, records from Diet meetings, best seller novels, and so on. This post isn't really all that content bearing, but there was only very useful resource that Mr. MAEKAWA mentioned in his talk: the demo of the KOTONOHA Corpus of Modern Japanese Search system (actual entrance is on a button click from the description page.) This is exactly what Alex was asking about in one of his posts: a Japanese KWIC (Key Word In Context) search. Anyway, that demo search could be a useful tool for non-native Japanese speakers. I'll add it to my toolkit of places to check when I'm mystified. This is a post that I've been waiting to make for a long time. Every weekend, I spend about one or two hours reading Murakami Haruki's "Kafka by the Sea" (村上春樹「海辺のカフカ」). I have been doing this for the past year, and finally today I finished the first book. Japanese books are often sold in two parts, so now I'll move onto the second and final part of this book. I expect it will still take another year for me to finish, unless I start trying to read it a bit on weekdays as well, but to be honest it is a bit difficult to read because I need to sit down somewhere with enough room to take notes in a notebook, and look words up in a dictionary. What I would like to write about is the vocabulary with which I had trouble. I sat and wrote the words I didn't know in a little notebook, and then entered them into a simple text file when I finished each reading session. I also added little notes summarizing what when on (I didn't start doing that until later though, so it isn't a complete description of the first book.) These words aren't the only ones that I didn't know, just the ones that I wrote down - there are probably 10 words or so that I just skipped entirely because I was reading on the subway and didn't want to drag out my notebook, or something like that. There were two words that I wrote down four times, nine words that I wrote down three times, 79 words that I wrote down twice, and the rest occurred only once. The good news there is that at least I did seem to learn most words after writing them down twice: very few words occurred three or four times. Also, there are a lot of words here that I really don't need to know. Murakami likes to use strange words, and he will use less-common characters for them also. I don't think I need to know 咀嚼, soshyaku, to bite. Don't normal people just use 噛む, kamu (to bite / chew)? On the off chance anyone else is interested in reading this novel, I'll put up my vocab list. For the past few weeks when I check out the news I've been hearing about the Handball Controversy. First off, I didn't know that handball was an olympic sport. I know there are lots of olympic sports that I don't know much about, but I have never seen anything about handball in the US. That is one interesting thing about Japanese TV: I see all sorts of topics that just are not on the radar at all for American Media. In general, I think American Media is just awful, reporting on unimportant things and ignoring interesting topics, completely dominated by large corporations and advertising to consumers. I like NPR, and that probably gives you a pretty good idea of what I'm about. Anyway, I can't say that Japan is all that different, but the NHK news here does touch on a lot more international topics than news in America. I've seen a few stories on the handball thing, and didn't really pay much attention but it seemed like there was some officiating controversy at the handball playoffs that decide who will go to the Beijing Olympics to represent Asia. I didn't get much more out of it than that - they played some clips, but I don't know the first thing about handball, so I didn't know what was going on. This morning I saw that Japan and Korea will be re-playing a tournament. Japan and Korea. That sounds like it could be explosive. These countries have a long history of competing, and it can get serious. Since I didn't know what was going on though, I did a search of the English web. Wow! Based on this afp news story and this story on China Daily it is even crazier than I thought! I basically thought that Japan and Korea had some problem with the officiating (and they do!) between the games they played. It turns out that they are accusing that the Kuwaiti team benefited from a late switch of officials (Germans to Jordinians) and cheated their way into an Olympic berth. Korea and Japan appealed to the International Handball Federation who ruled that the tournament be re-played. The president of the Asian Handball Federation, Kuwaiti prince Sheikh Ahmed Al-Fahad Al-Sabah (who also serves as the head of the Olympic Council of Asia) does not sanction the replays and has threatened action against any other nations that play in them. So in the end only Korea and Japan are playing in the IHF re-plays. The women play tonight, and the men play tomorrow. I just wonder what will happen with the results? I mean, two teams can't make up an entire tournament, can they? And now I'm watching "Sanma Palace", which is a show with a comedian that takes to a bunch of other "talent". I don't get it. Also, they broke the talent into two teams, the "complete idiots" and the smart team. But when you look at the text they use to title the segment, it is the "not intelli(gent)" (ノットインテリ) against the "intelli(gent)"　(インテリ). I think - I'm just guessing, and usually that means I've completely and horribly misunderstood the Japanese. I liked when they introduced the baka team with a segment "this is when you realized that you're stupid". D: It's really cold tonight, so after dinner why don't we take the train home instead of walking? R: Yeah, it's really cold today. That's a good idea. Oh but wait, hey hey, I lost my watermelon! D: You lost your watermelon? R: Yeah, I had it yesterday, then I went to my friend's house, and now I can't find it! It's really inconvenient! D: It's inconvenient that you lost your watermelon? In the winter? Of course, things became clear shortly thereafter: she was talking about her JR RFID-style card, the "Suica", which is a homonym for watermelon. I was so confused. Every new year in Japan, retailers put together bags, call them Lucky Bags, Happy Bags, Grab Bags, what-have-you, but essentially they are a collection of goodies for a good price. I bought the 2008 Muji Happy Bag, and here are pictures of what was inside. Do you know fukubukuro? 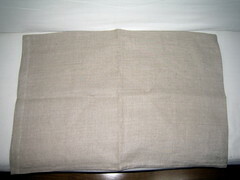 (福袋 - literally good fortune bag) It is a bag at a store. It costs maybe 1000 yen, but has 3000 yen of stuff inside! 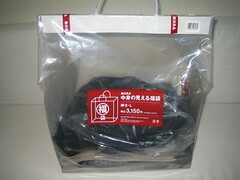 The way these bags work is that you generally have a bag for some set price, say 3000 yen, and unknown contents inside. Generally you can't see into the bag so you don't know what is in there. It's a gamble. (Given the Japanese peoples incomprehensible love of Pachinko it comes to no surprise to me that they like the idea of a random gamble on a bag of unknown stuff.) This strikes me as an interesting propsition on two grounds: it is good for the merchant because you can use the happy bag as not just a loss leader, a way to draw people into the store, but also as a way to manage inventory: you need to get rid of the 2007 models and make room for the new, trendy 2008 models. I don't follow Japanese fashion magazines, but this place is dominated by magazines that set trends (see Neojapanisme, clast, or jeansnow.net for more about that) and last year's stuff just won't do. 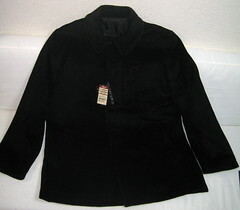 Since you are selling this bag of stuff, you can throw in things that didn't sell well or that you are overstocked on, drop the price a bit, and people are happy because they are getting a good deal. That's a win-win situation. It also has the advantages of a video game system bundling deal: you can put in a few stinkers with the winners and hopefully people will overlook that fact. Having the Happy Bags be opaque is very interesting because now the merchant is faced with a problem: dump a lot of crap that isn't worth much into the bag and make some money, or put really good stuff in there, possible take a loss, but possible gain customer loyalty in the process? It is a tough call. Personally, I wouldn't want to a get, for example, a Don Quixote happy bag, but I'm pretty sure I would be interested in a Muji or Uniqulo happy bag. Anyway, I have more confidence that Japanese companies would take the long-term view and generally try to put good stuff in their bags. I'm not sure that I would trust American companies to do that same thing. I think the closest thing, the Black Friday sales in America, are similar but have some bad sides to them as well: for example, generally the best deals are limited to a certain number per store, and now have resulted in not-infrequent tramplings and mad rushes at the stores. I don't think that happens as much in Japan, but then again I didn't line up for any 初売り (first shopping!) trips either. Anyway, the short of it is that I went and bought the Muji Happy Bag this year. 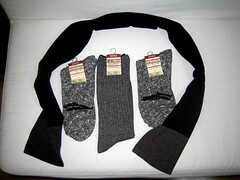 It is the first year I had ever heard about them, and I was thinking of stopping by Muji and picking up some socks and a hat. Thinking about the bag, maybe there would be socks and a hat in there. Muji seems unusual in that their Happy Bag is see-through. I like Muji a lot. I haven't written about it, but I think that the idea of a brand that is personified by the lack of branding, is really interesting. Japan is more or less brand obsessed, and a brand that is unbranded is still somehow a brand (you can tell by color schemes, design scheme, style, function, and so on.) Anyway, they expect that they can sell more bags when people know their contents as opposed to not. I think that is because Muji is an honest and reliable store. And I like their socks. Anyway, I like this idea of Happy Bags. I have a lot of blogs written by foreigners in Japan, and over on Tokyo Manga Lisa writes about the women's Muji vs. Uniqlo Happy Bags. The Tokai Seven: like Ocean's Eleven, but much older. And less criminal. They are both pretty lucky though. 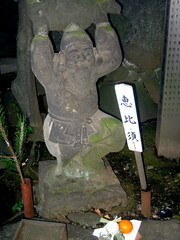 The Seven Gods of Happiness represent different types of good fortune, and for some reason in Shinagawa there are seven temples, each devoted to one of the Gods. 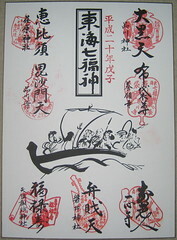 One of the traditions of the New Year is the 初詣, the first visit to a temple of the new year, and while often this occurs at midnight, it isn't unusual for the first visit to be done anytime in the first few days after the new year. 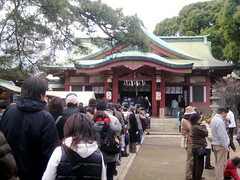 The most busy time of the year is probably the First, and the most busy temple is probably Meiji Jingu. I'm not going to brave those crowds, but since I was staying in Shinagawa, Lisa and I decided to make the rounds and visit all seven temples. I didn't know much about the different Gods when I was visiting the temples, but I did do a little bit of research when I got back home. A "little bit" means that I looked them up on Wikipedia, and noticed that there was an English page as well as the Japanese page. So now you know about as much about them as I do. It took a long time to visit all of the temples. I don't remember the order that we did it (although possibly you can reconstruct the order from the pictures on Flickr) but it took us two days. We visited five on the first day, ending with Shinagawa. 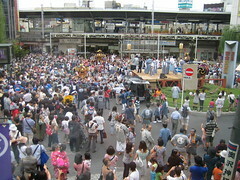 Shinagawa temple was probably the largest of the lot, and had police managing the crowds. We waited for about forty minutes or more to make our offering there. I also picked up an Omikuji (お神籤), which is a written fortune. I was lucky and got "The very best of luck" (大吉) so I'm hopeful that this will be a good year. So far, so good anyway. After the long wait, and previous hour or so of walking around going to the other four temples, we decided to go back to Lisa's parent's place. 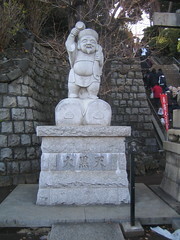 The next day we went to the last two temples, Iwai Temple and Tenso / Suwa temple. I've never seen a temple with two names in it like that before, and I wonder what that is all about. I'm sure I could figure it out if I did some searching on the Japanese web, but I'm not too interested in doing that right now. The Japanese web makes my head hurt when I stare at it for too long. 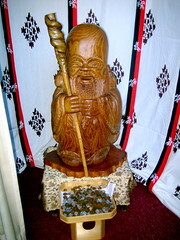 Iwait temple houses Benzaiten, which I think is my favorite of the Gods because I've always been a fan of Benten Records, a record label that focuses on female Japanese bands. In all honesty though, I think you would be best off with Fukurokujyu, since that God seems to be a general jack-of-all-trades Gods. Also, unless I'm really bad at looking these things up, it looks like there are two Gods of Wealth (Can't have too many of those I guess) and some other overlap also, but nobody ever said that your pantheon had to be orthogonal. If I was to build my own pantheon though, I would probably try to select both orthogonal and complementary Gods, but that's just me. I really enjoyed this trip around to various different temples, and now that I've looked into it, there are lots of these things. 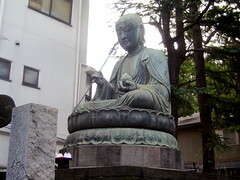 http://park1.wakwak.com/~hisamaro/tokyo2photo.htm lists many different temple tours, and has a convenient list of temples and gods for the Tokai Seven. So I'm sure there are lots of other temple courses I can try out - but to be honest, it is a lot of trouble, and probably not something I'll repeat. 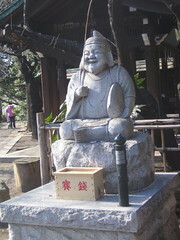 Note: while writing my post, I relied on http://www.evam.ne.jp/tokai7/index.html as a general site on the Tokai Seven Gods of Happiness. 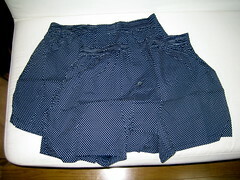 But I didn't rely on it too much because it is part of the Japanese web. I feel obliged to say that the next few posts on my blog will be about the New Year in Japan. None of them will really have interesting observations that haven't been made before, many times, by foreigners in Japan. That is one kind of interesting thing about being a foreigner in Japan: you go through phases. I'll have to write about that at some time, but we all go through a "I'm a funny guy and will comment on these crazy Japanese" as well as a "wow, look at all the cool cultural things they have here" phase. You can probably find any number of similar posts on the blogs listed at the Japan Blog List. The main thing to which I was looking forward was Osechi Food (おせち料理), which is the kinds of food that families each over the New Year's Holiday. I never really had a good idea about the food consisted of, and now after having experienced it, I'm pretty sure that there are not any real set dishes aside from a few common things, and that anything can be Osechi Food. It is just a time for the family to gather, sit around the table, eat, and enjoy. 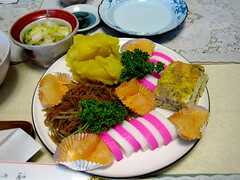 On New Year's Eve it is traditional to eat a special kind of Soba called Toshikoshi Soba. I didn't know the origins of this custom, and found two interesting sties with more information on it. One is at jpn-miyabi.com and the other is at urban.ne.jp. It seems like soba (buckwheat noodles) are traditionally thought to symbolize long life and good fortune. 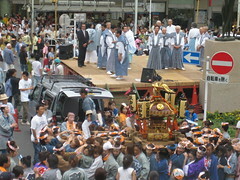 The custom dates back to the Edo period, perhaps around 1700 or so, perhaps earlier. 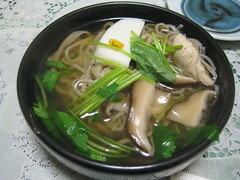 More interesting is this post over on justhungry.com where they have a nice recipe for Toshikoshi Soba. 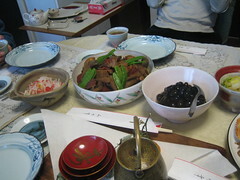 The Soba that we had was nice, although grandma humbly complained that it has weak flavor, and tasty. It had some great wild mushrooms in there, and some chicken. I hope it passed on to me the attributes of long life and wealth, but I'm afraid all it did for me was to fill me up before the main course: Sukiyaki. 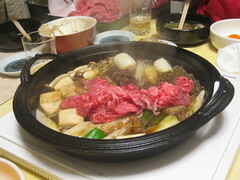 Sukiyaki is a food that it seems like is a traditional Japanese "comfort food". Lots of people associate it with happy times with the family, sitting around the table and talking happily. I have had Sukiyaki a few times, and I think it is really great. Absolutely delicious. I was told that the Kansai (Kyoto / Osaka area) version of Sukiyaki uses a sweet sugar base with Mirin, while the Tokyo version uses a salt-based sauce. This version was the sugar-based one, and I thought it was great. 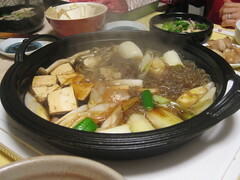 What happens is you put food - vegetables, meat, and so on - into the Sukiyaki bowl, and pull it out as it cooks. If you like, you can take a raw egg and crack it open into a bowl, which you then dip things into. I am not crazy about the raw-egg-on-things custom that the Japanese harbor, but I don't dislike it. 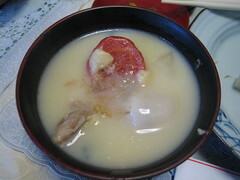 (Other places where you can find this include Yoshinoya, where you can get a raw egg to put on your beef bowl, and many of the "o-don" dishes where the raw egg cooks, essentially, over the hot rice.) Incidentally, you can buy eggs at the supermarket that are specifically meant to be eaten raw for this kind of purpose. I suppose they have some sort of higher quality standard for safety or whatever, but I'm not really sure. Along with the Sukiyaki meal there were other small dishes, such as mochi (rice cake) both cold and hot with soy sauce on it, and of course alcohol. The New Year's Eve meal was accompanied by sake and beer. And not a small amount: every time I checked, my cup had been re-filled. I also made sure to do my duty and keep the cups of those around me full. After dinner, we all gathered around the TV to watch the special sets of shows that are specific to New Year's Eve, and pass the time until midnight. I won't go into detail about that here, but shortly after midnight we went to bed. I slept on a Japanese futon, the first time in quite a while, and woke up with a sore back. The next morning at 9:00am we gathered for breakfast, which is the proper Osechi Food. There were two main components to the meal: the Ocean Foods, and the Mountain Foods. The Ocean foods consisted of things from the Ocean and peculiarly a sweetened mashed-like Potato dish that I really enjoyed. I liked the Ocean Foods a lot because they are colorful and made a very pretty arrangement on the plate. The traditional colors of the New Year are Red and White, and some delicious seafood cakes took on those colors. Sadly, I don't know what everything on the plate is, but it was all quite nice. The Mountain Foods are fresh vegetables and things like that, including mushrooms and other things that I don't know. 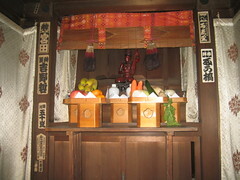 As with many of the foods, some were round and in a ball-form since that symbolizes good luck. There are some beans that are traditional as well, but I don't know the story behind that. Interestingly, you can see in the lower-left of the photo that I took that there is a bottle of Sake and three bowls for drinking, each smaller and with a good-luck character written on them. Before breakfast everyone at the table had a saucer of the sake before the saucers ended up with their rightful owners (in this case, the head of the household, his daughter, and myself.) I enjoyed having sake for breakfast, although it isn't something that I want to do every day. The final part of the meal was the Mochi (rice cake) soup. I'm not sure what all was in it, but it was quite nice. As with the previous night's dinner, mochi (rice cakes) were present and I was given a rice cake roasted with soy sauce and then wrapped up in nori (seaweed.) It was nice, but those rice cakes can fill you up really fast. They are heavy, sticky, and sink to you stomach. I'm pretty sure I added a layer of fat composed entirely of rice cake over this three day period. After breakfast Lisa and I headed out for our first temple visits of the year, which I'll document in a later post. We returned after a few hours, and snacked on tea and some cakes, before dinner at 6:30pm. I didn't get any pictures of the tea that we had, but I had a very, very large amount of tea over those three days. Dinner was Western Style (on my account?) 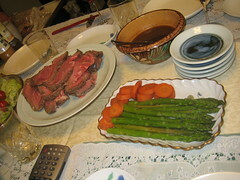 consisting of Roast Beef that Lisa and her grandmother cooked previously, some salad, and leftovers from the previous day's food. Of course, the Sake tradition continued, but this time we also had two bottles of Red Wine to go with the meat. The roast beef was quite nice, but curiously served cold. Actually, that isn't all that surprising; Japanese often eat meals (Bento boxes in particular) which are cold, and I've had roast before here before that was served cold. It was still quite nice. To accompany the beef there were two sorts of sauces: one was standard Wasabi like you would get with Sushi, and the other was a type of salt, called "Yuzu Salt", that was very nice. Yuzu is a Japanese Citrus, and this salt was made with Yuzu in some way. I've equated it with Garlic Salt in my mind, and will try to pick some up next time I'm at a shop that might have some. After dinner, I went back home so that I could sleep in my own bed, but I was asked to come back for breakfast the next morning at 9:30am. Breakfast consisted of the same foods seen previously, and more Breakfast Sake. To tell the truth, I was still absolutely stuffed from all the food over the past two days, but I think the point of the New Year Holiday is to save up energy and fat for the coming busy times when everyone goes back to work and does their standard twelve hours days subsisting on only ramen. After breakfast the family watched some more TV, then Lisa and I went out to hit the last two temples on our temple card. More on the Temple Visits and crazy Japanese New Year's TV at a later date.